Breakfast is serious business in our neck of the woods. Portrayed by the brunch episode in the show “Portlandia”, yes we are crazy about brunch. I am not sure why sleeping in stumbling out in to bright blinding morning sun, grabbing a cup of hipster brew along the way just to stand in line or mill outside just to get in a hip brunch spot. I often second guess my self on why we put our selves through the torture of just hanging out to get some eggs and toast. Well maybe the answer lies in that possibly on Sunday morning we are just lazy and it’s just easier to stand in line some where to get some food. Well for us since we often love to run the gauntlet on the weekend brunch seen in Portland we also Macgyver it in our camo fleece sweet pants. Heck, it’s way cheaper than 50 bones anyway, plus bloody mary’s and mimosas and not to mention coffee is a fraction of the price at home. Hash is just simply coarse food, or just simply chopped ingredients. I guess this is where our beloved brunch fav comes our beloved hash browns. Who knew that hashing meant to chop or make into small pieces. We love sweet potatoes and and fresh flavors from our garden, and lastly anything out of our garden. Often its just what we have on had or what we can scrape together. Why not just take what we have and just chop it and cook it up? I think naturally this has been happening since the beginning of our existence. Traditionally hashes have browned onions, meat, and potatoes. There are many forms of hash from just simple cored beef hash to very refined sophisticated hashes. Many people have devoted a grate deal of energy and time to the hash and there are even various books on the topic. But probably if you are still with me, it just comes down to just enjoying some delicious hash at the top of the morning. 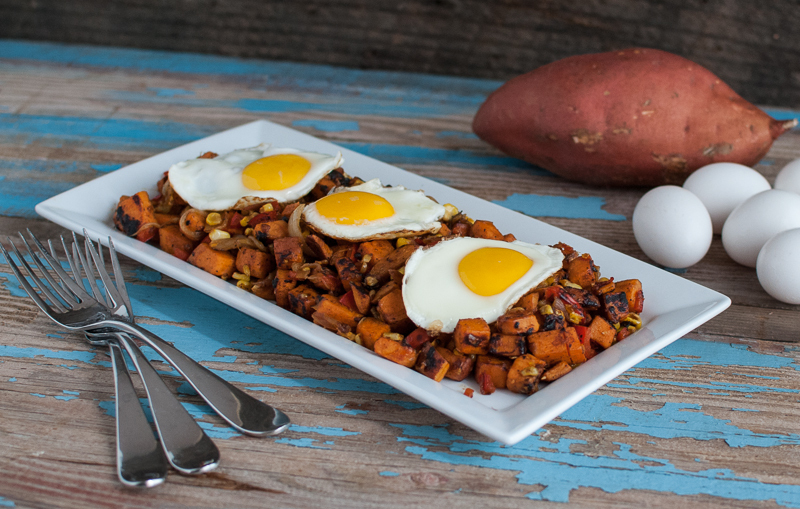 Thank for coming with me and I hope you enjoy our take on one of our brunch fav’s, our Sweet Potato Hash. Heat a large non-stick on medium to medium high heat. Chop sweet potato in to 1/2" cubes, slice onion, slice and chop pepper. Add oil to skillet and ingredients. Stir every 2-3 minutes for 20 minutes or until sweet potatoes are soft.